A shooting at Fort Hood Wednesday afternoon left four people dead, including the gunman, and 11 wounded. It was a horrifying incident on its own, but also the second active shooting to take place at Fort Hood and the third such incident on a U.S. military installation in the last five years. What is happening in places that are supposed to be the pillar of the nation's defense? The seeming frequency of the attacks does coincide with the end of two wars abroad that have left thousands of combat veterans who might need counseling. But it also coincides with a steady rise in active shooter events since 2000. Until 2009, there were eight or fewer shootings each year. In 2009 that number jumped to 16, and peaked at 21 in 2010. It has remained at over 10 per year ever since, and there have already been 14 incidents this year. On military bases, "we're going to see not anomalies but regular human behavior, because that's what we are," said Chris Grollnek, a former Marine and law enforcement professional who has become an expert in training for, responding to and preventing active shooter situations. Yet there is something shocking to the nation about a shooting that takes place on a military base. The last shooting at Fort Hood took place in 2009, when Army Maj. Nidal Malik Hasan opened fire killing 13 people and wounding 30 others. It was later discovered that there were several overlooked warning signs that Hasan was an Islamic extremist bent on killing civilians. And just last September, government contractor Aaron Alexis shot and killed 12 people in the Washington Navy Yard. He had lied to Veterans Affairs doctors about his serious mental health issues. 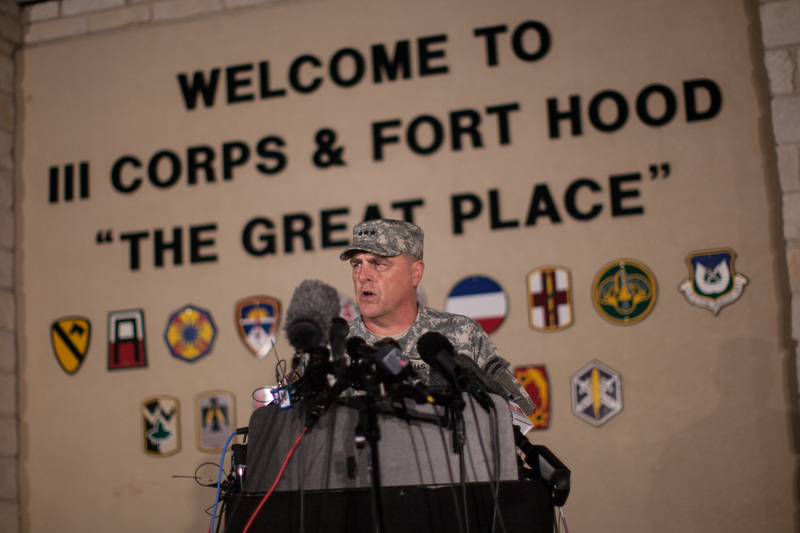 The second Fort Hood shooting Wednesday afternoon appears to be a dispute between soldiers with no connection to terrorism. The shooter, Army Spec. Ivan Lopez, had served in Iraq for four months in 2011 and was being evaluated for Post Traumatic Stress Disorder (PTSD), authorities said. "We would like to think that military bases are more secure," said Fred Burton, the vice president of intelligence at Stratfor, a geopolitical intelligence firm. "People think society's problems stop at the gate and they don't." Burton, who was a longtime counterterrorism agent with the State Department and worked on many investigations, said he hasn't seen any signs this is a terrorism-related event. Rather, it's the product of life on a military base so big it's the size of a city - and comes with the same kinds of problems you would find in any city across the U.S.
"These places are so big they have real-world problems so you're going to have all kinds of general criminal activity from domestic dispute to workplace violence to criminal theft to DUIs," he said. "Society at large intrudes on these kinds of locations, I'm sad to say, much like it does in any workplace." Though this shooting may be just that - a workplace dispute - Grollnek said that many active shooter events occur in the same locations as people seek the media coverage that previous shootings received or try to beat the increased security. Much of the response to the increased number of active shooter incidents has been focused on improving the response from law enforcement. His firm, Countermeasure Consulting Group, focuses on training bystanders how to respond to a shooting during the average 14 minutes it takes for law enforcement to respond. Military bases in particular could benefit from preparation for these events, Grollnek said. "With the escalation of federal locations in the media spotlight right now, I think it would behoove military installations to aggressively seek prevention and training," he said. It's also beneficial given the number of returning combat veterans who return and need counseling, Grollnek added.